It has been a long time coming, but there are now native ComicBase apps for your iPhone and iPad, as well as your Android phone or tablet! Instantly view detailed comic information and current values for over 850,000 comics by typing in a the title and/or issue number—or just use your device’s camera to scan its barcode! Add new items to your collection while you’re on the go, then use ComicBase’s Internet > Check for Sales and Purchases command to automatically add them to your collection when you get back to your main computer. In years past, we’d been able to do several of these things using the “My Comics” web app, but the new native app adds a whole new level of capability and speed. Barcode recognition, in particular is hugely improved, since the new app can continuously scan for the barcode until it gets the shot it needs—versus the old web app which needed you to (very steadily!) take a picture of the comic’s barcode and try again if the resulting picture was too blurry. Of course, a dedicated barcode scanner is still the fastest at beeping in a lot of comics, but the new ComicBase Mobile app is easily an order of magnitude faster and more reliable for use on the road than the old web app. ComicBase Mobile is available as a free download from the Google Play store for Android, or the iTunes App Store for iPhone and iPad. This is a brand new release, so be sure to use the full name when looking for it (or just click the links above). And if you’re not using ComicBase Professional or Archive Edition (or—Heaven forbid!—your update subscription has lapsed), head on over to the ComicBase Registrations page and renew or upgrade today to take advantage of all the great new stuff! ComicBase Sidekick is the key to synching your database with ComicBase Mobile. It also learned several new tricks with his latest edition—available a right now at the link in the headline. Important Note: If you have any other updaters to ComicBase 2017 installed, you need to use the Add and Remove Programs control panel to uninstall them before installing the new updater, or you’ll get a "Another version of this product is already installed" message when running the updater. Uninstalling old updaters won’t affect your ComicBase data. The new Sidekick is faster at saving backups, and saves them in a more modern format which makes for uploads and downloads that are about 40% smaller than before. It also has numerous stability improvements and bug fixes; and a new way of handling messaging that is far less intrusive than before. That’s just some of the many updates--see the release notes at the link above for the full list of changes. ComicBase Sidekick has undergone some serious upgrades to allow it to act as the key player to synching your ComicBase database with ComicBase Mobile. For starts, the new version of Sidekick automatically updates your mobile collection statistics every time you use Sidekick to check for updates or save your backup to the cloud. You can also set ComicBase Sidekick’s “Save to Cloud” settings to automatically generate reports on your collection—perfect for viewing on the go with ComicBase Mobile, and making sure that you’ve always got the latest collection info with you. 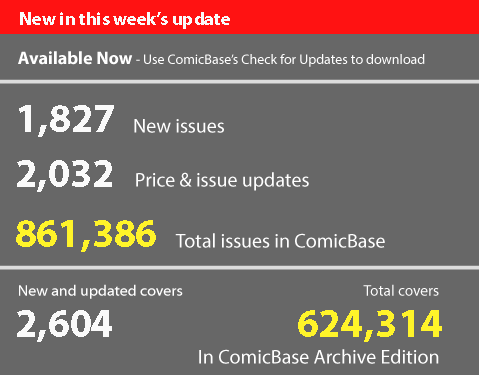 If you have more than one database, ComicBase Sidekick will update them all, and you’ll see all your databases and reports listed at the top of the ComicBase Mobile app. It’s not a bad idea to have a quick look at ComicBase Sidekick’s Settings and remove any unneeded databases from the list of databases it manages. You can also control which databases appear in ComicBase Mobile by removing any unneeded ones on your ComicBase.com Profile page. There’s a lot of exciting new stuff going on in the world of ComicBase, so if you have any questions, remember that we’re here to help. Just send questions or comments to support@comicbase.com, or call us at 408-266-6883 if we can help you out with anything ComicBase-related. ComicBase Blu-Ray Archive Edition uses its huge capacity to let us bundle our entire art library at the highest possible quality on a single 50 GB Blu-Ray Disc. It also includes a year of quarterly updates delivered on Blu-Ray Disc. The first quarterly update of the year is being sent out this week to our ComicBase Blu-Ray Archive Edition customers, including some 624,314 covers in all, as well as the full installer for the brand new ComicBase 2017 Director’s Cut version 19.4.3. If you’re a Blu-Ray Archive Edition customer, be sure to check your mailing address under your Contact Info—the new Q1 Blu-Rays are geting shipped out at the end of the week, and should start arriving in your mailbox starting early next week.